Pricing will be $20 up until 2 weeks prior to the event. Prices will increase to $25 until the day of the event. Join us for our 3rd Annual Gay-la & Membership Drive on April 4th from 6-9pm at the Cottonwood Country Club! 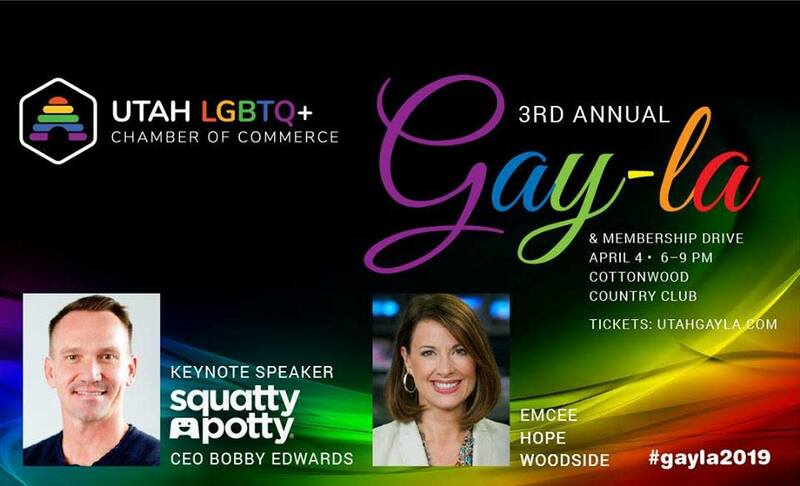 This is the Utah LGBTQ+Chamber's premier event and it gives you an opportunity to network with a phenomenal group who support Utah's LGBTQ+ community. Come be entertained by the amazing Tribeca Ensemble, hear from our brilliant keynote speaker, Bobby Edwards, CEO of Squatty Potty (featured on Shark Tank Dr. Oz and many other prominent National and International media outlets) and relax the night away at this fantastic venue. Hope Woodside is our emcee for the evening. Gia Bianca Stephens is one of our special hostesses. Bobby Edwards will be speaking at 7:30pm. Tickets are limited so get yours today! We hope to see you at the event!